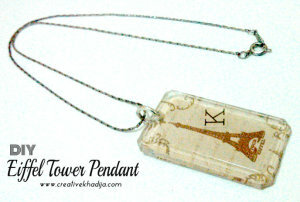 Do you like handmade jewelry? 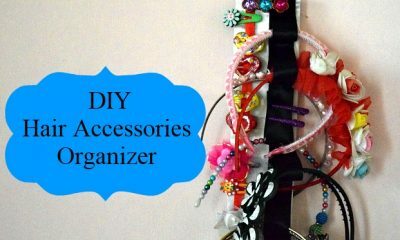 Have you ever tried some DIY idea of making any accessory for yourself? 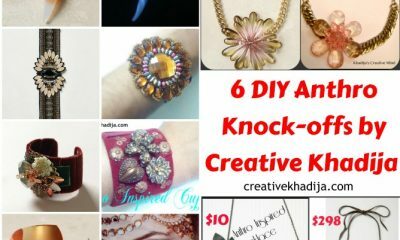 I love easy and quick jewelry making ideas and I have designed many for myself as well as my friends. 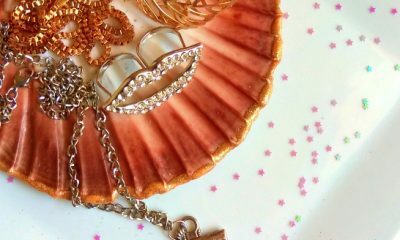 If you are following me for some time, you might already remember my previous handmade jewelry and accessory DIY ideas. 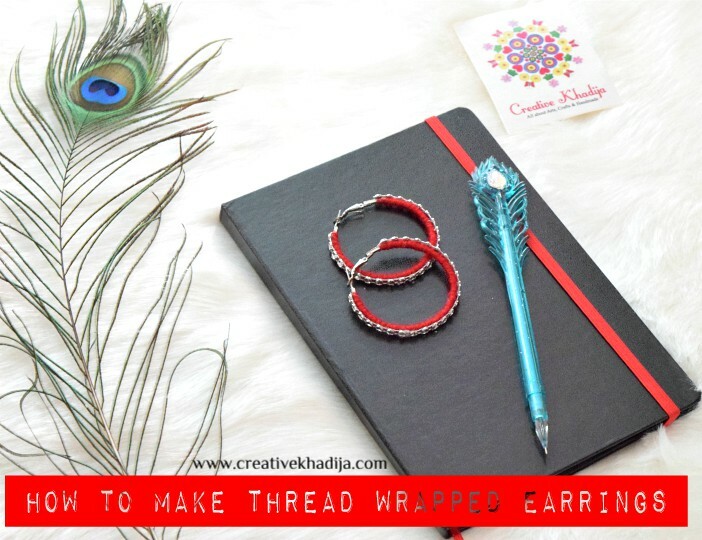 Today I am going to share a super easy and quick Wool Thread Wrapped Hoop Earrings tutorial. 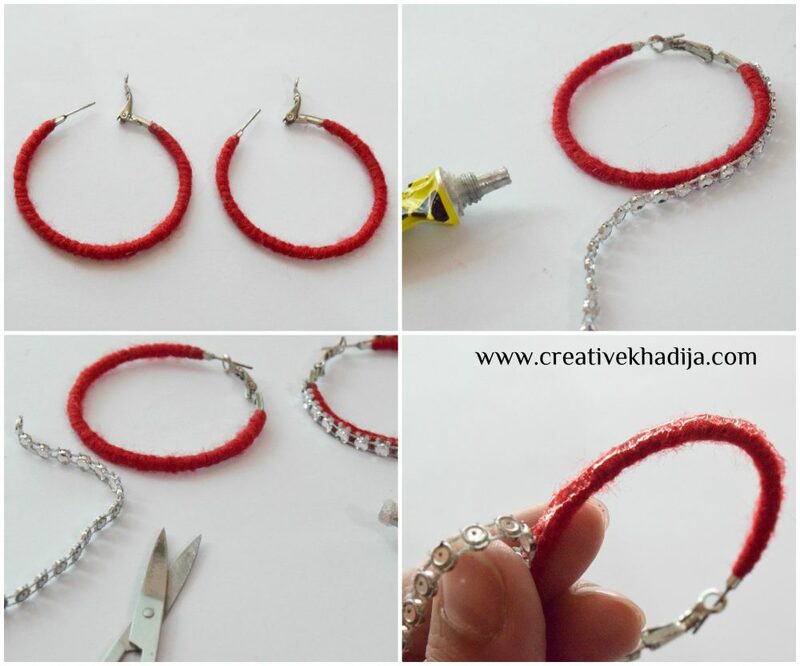 I hope you will enjoy this idea to refashion any old rusty pair of hoop earrings. I have designed a rusty pair of hoop earrings. I was not wearing these since long because of their rusty look. 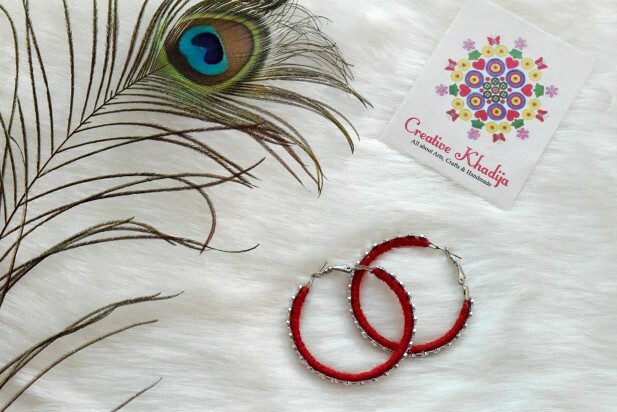 Recently I thought to design it and wear again as the hoop earrings are trendy these days. 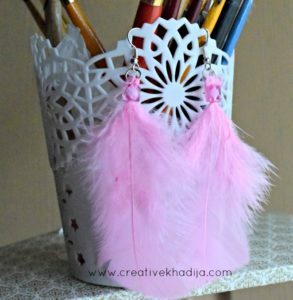 Have a look how I have turned an old pair of earrings into a complete new look. 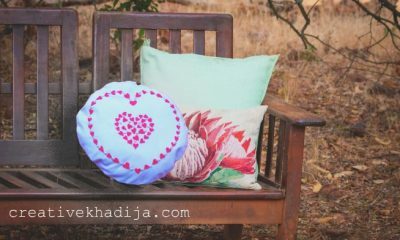 Quick crafts with less supplies are my favorite kind of DIYs. Who likes to collect a long list of craft supplies? Atleast not me..hehe! I try to make crafts with available supplies mostly. Also as I am a craft supplies hoarder, so I keep collecting stuff for no reason. I find it later & use it while crafting then. Take a 20 inches long wool thread and double the thread together. 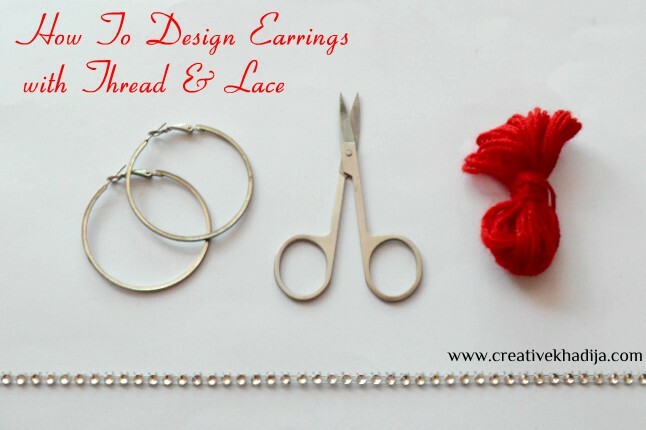 You can decide the length according to your earring size. 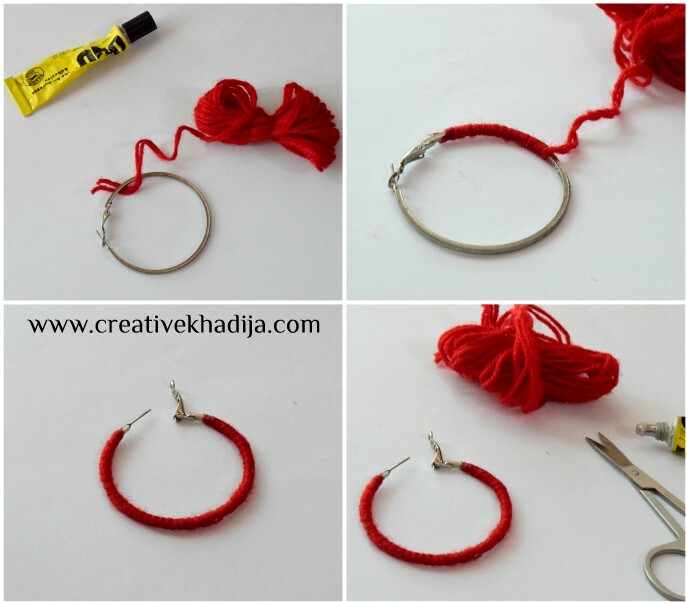 Glue it on the point where you are starting to wrap on the hoop earring. Apply glue on the metal, so thread will be adjusting on it well, wrap around and glue the ending carefully. It should not be too close to the locks or too far from the locks. Whatever looks better, go for it according to your choice. Wait for a moment until thread gets fixed on hoop. Then apply some transparent glue on the thread and paste the rhinestones lace. 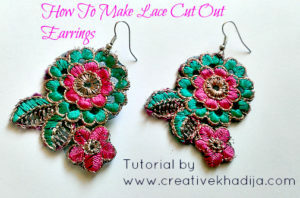 It would be better if you will measure & cut out the lace before pasting it on the earring. 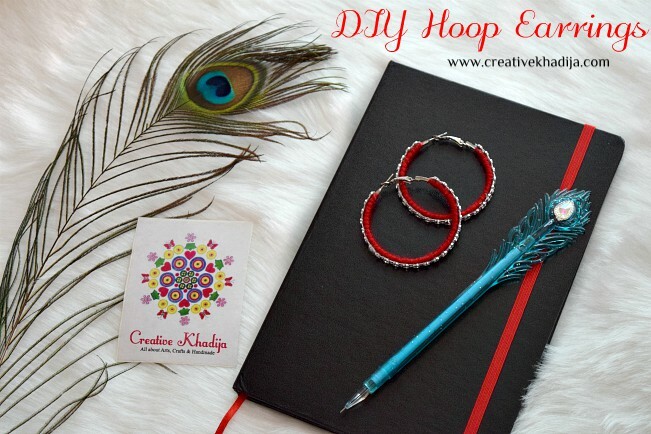 Simple, easy and quick DIY for giving your ordinary plain hoop earrings a new look. Isn’t it? I hope you enjoyed my tutorial. 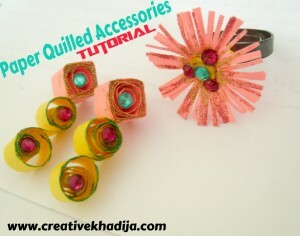 You can also have a look at some of my previous Jewellery Making DIYs. 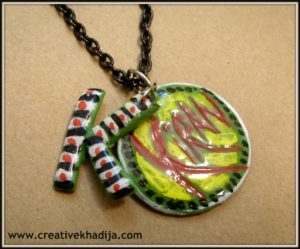 You will find my step by step tutorials of earrings and pendants making mostly. They are super easy and any newbie can try it well. So pretty and such a simple idea. 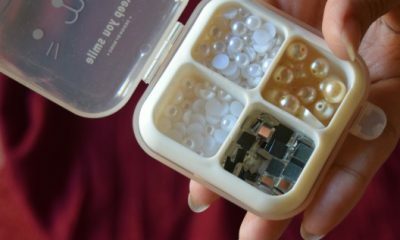 Now I could make earrings in any colour I like – fab! Thanks a lot Julie :) You should give it a try! Love these earrings — so very pretty! Beautiful! I love the color, too! You make them look so easy! I love these!